Below is the same data smoothed with a 4 year moving average to show the overall trend. 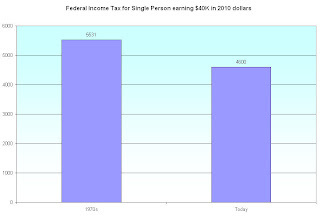 Those with high incomes are paying less in taxes than they did. But the problem is more widespread. 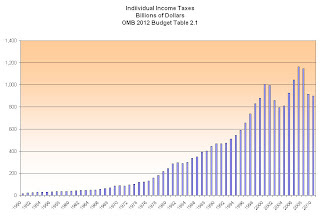 ALL of us are paying less in Federal income tax than we used to. 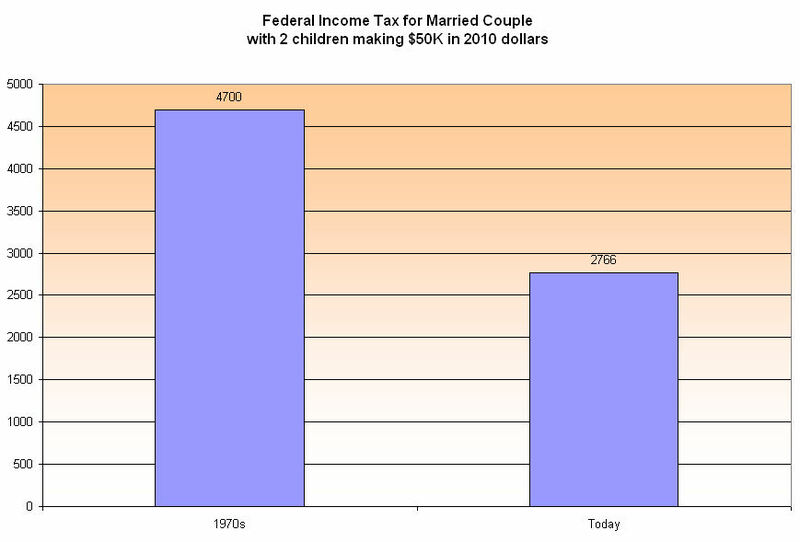 In 1974, a low income couple with two children making $7000 paid $400 in income taxes. 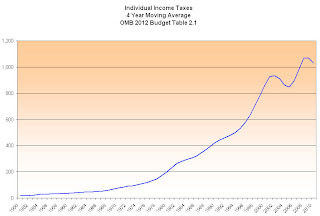 In inflation adjusted dollars, that is $31,000 dollars of income and a tax bill of $1800. Under current tax law, a couple with two children making $31,000 would get a net credit of $2522 in income taxes. They would get this credit through the earned income credit program. 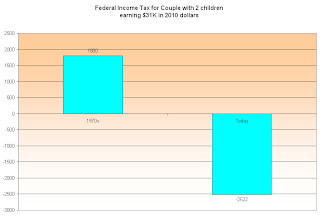 For this couple, the difference – the tax savings – between the tax policy of the 1970s and today is $4300. 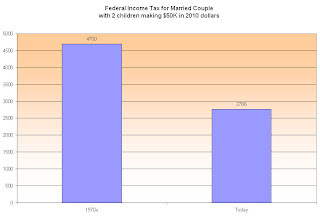 In 1978, a couple with two children making the equivalent of $50,000 in 2010 dollars paid the equivalent of $4700 in income taxes. Under existing tax policy, they pay $2766, a savings of almost $2000. 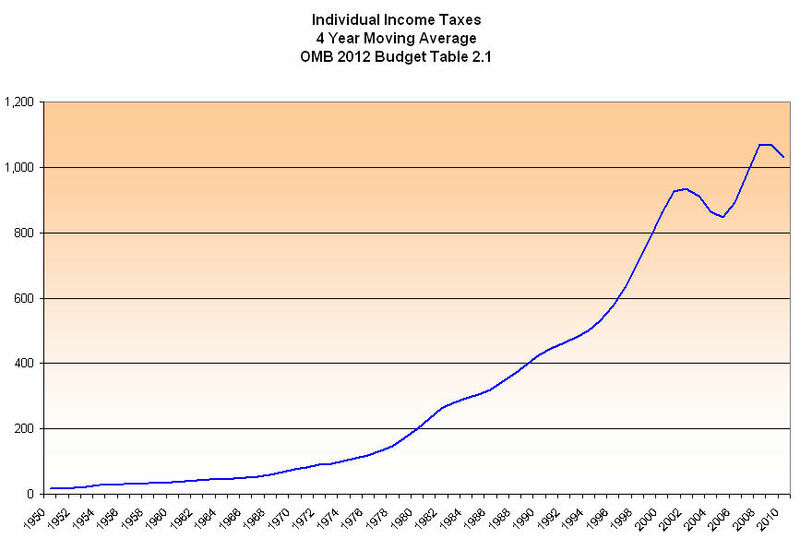 In 1978, a single person making $12,000 paid almost $1700 in income tax. 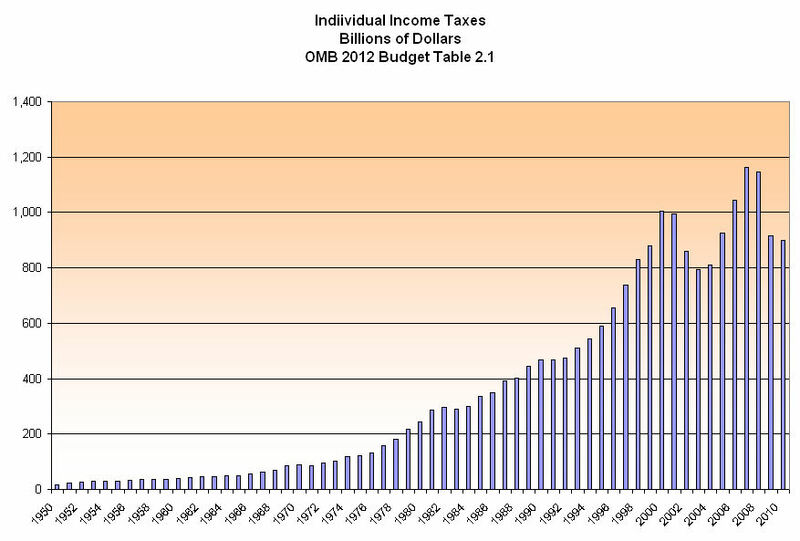 In inflation adjusted dollars, those amounts translate to $40,000 income and a tax bill of $5500. What would a single person making that same money pay today? 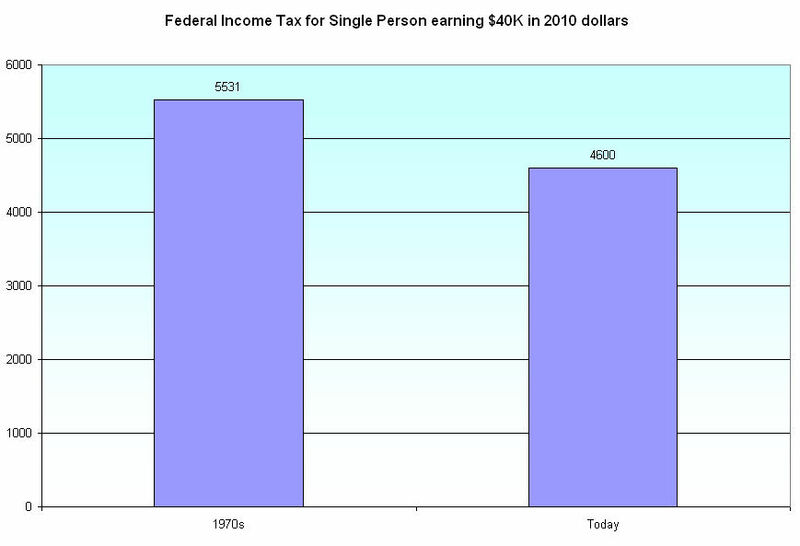 $4600, a savings of $900 when compared to the tax policies of the 1970s. In the past 30 years, the taxpayers of America wanted lower taxes and they voted in the politicians who would give them lower taxes. Many of us wanted more environmental and labor regulations, social support programs and we got those too. Many of us voted for more defense and we got that. Military bases mean jobs for a lot of voters and voters like jobs. So who is going to pay for all of this? “Not me,” we all said. “Get it from the other guy,” we moaned. Eliminate the corporate income tax and raise the tax rate on the profits that they pay out in dividends to shareholders and stock awards to company officers. The accountants and lawyers at the IRS will never be able to compete with the tax accountants and lawyers at large companies. Consolidate duplicate regulatory government departments which overlap in their oversight responsibilities. Well meaning and egotistical congresspeople want their own agencies supervised by their committee and the result is a hodge-podge of agencies. Reduce spending, beginning with Congresspeople themselves. If tax revenues decrease, then the budget allowance of each Congressperson’s office should be reduced by the same amount. While the millions of dollars involved are negligible within the scope of the entire Federal budget, it enshrines a principle that if taxpayers are tightening their belts, so should their elected representatives. Make a dedicated effort to detect fraud and overcharges in defense and entitlement programs and prosecute the perpetrators. If we continue to put off these decisions, it will only get worse. Each year, as we have to pay more in interest on the nation’s debt, programs will continue to experience budget cuts, provoking an economic and class warfare that may permanently scar the spirit of the people of this country. We owe it not only to our kids but to ourselves to make some difficult but prudent choices soon.